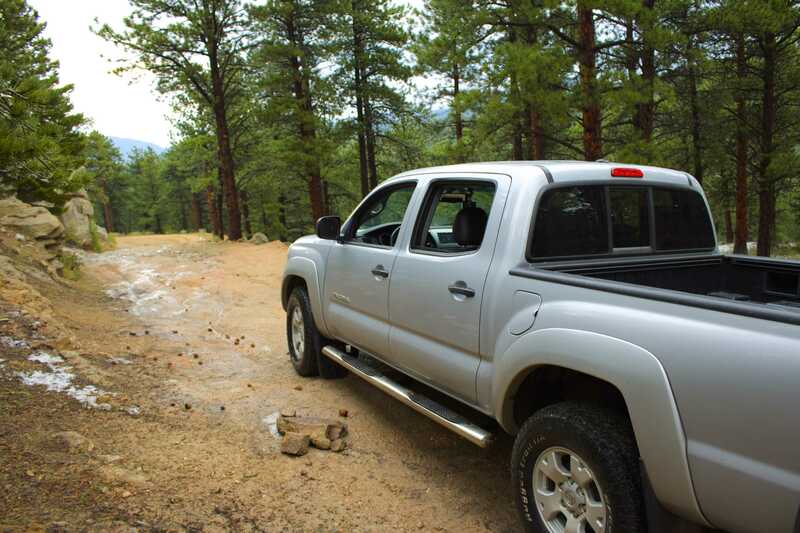 Off-Road Excursion is a new series of articles and videos that will cover the best 4×4 trails in Colorado and beyond. If I’ve taken my 2011 Tacoma on the trail, I’ll add it to the site, hopefully with video. I’ll only feature the trails I love and call out the trails I don’t. In this inaugural episode of Off-Road Excursion, I’m hitting up West Magnolia Trail just south of Nederland, Colorado. West Magnolia Trail was an interesting find. I spent a few hours researching trails in Colorado to figure out what my Tacoma would be able to handle in a stock configuration. I haven’t added anything special like skid plates or coil suspension to this truck yet, so I wanted the trail to be at a medium difficulty. I hit up trails.com and found that Switzerland Trail and West Magnolia Trail were within an afternoon’s jaunt from my house. I called up a couple friends, and we hit the road. Our first stop was Switzerland Trail just outside of Boulder, CO. It was a huge bust. We saw some guy with a Subaru Outback driving on it, so you know it’s not a real 4×4 trail. If you’ve never been to Colorado before, the views are great. For those of us who’ve been here forever, it’s nothing but mountains — no cool rock formations, no features, no real wheelin’ fun. Unless you want to take your touristy parents “off-roading” and show them the mountains in Colorado, I’d pass on this trail. We snagged dinner in Nederland (about 20 minutes from Switzerland Trail), then headed a few miles south to the West Magnolia Trailhead. We came in from the north and ran the six-mile trail north to south. The trails.com guide suggested driving it south to north, so we recorded the video that direction on our second pass. If you hit the trail from the southern end, you’re actually starting in Rollinsville, Colorado. We definitely recommend hitting it from the northern end; it was more fun that way. When you’re done, head down to Blackhawk, Colorado, and hit the tables. There aren’t any tricky parts to this trail in my opinion. The biggest feature is the steep hill toward the north end. I didn’t have any trouble with it from either direction. You just have to commit and hit the gas on the way up. If you run it from the south, take your time on the way down. Other than that, there are a few spots on the trail where only one truck will fit. Make sure you’re paying attention to your outs. If it’s easier for you to reverse into a clearing, do it. This isn’t a high-clearance trail. A stock 4×4 truck should be able to handle it. You may scrape the road a little bit, but that depends entirely on your driving skills. If you care about the paint on your truck, you should probably pass. It’s impossible to keep the tree branches from rubbing up on your truck. It’s nothing a little buffer time couldn’t fix. This trail also allows ATVs and dirt bikes. On the third pass, I pushed my truck hard and completed the whole trail (road-to-road) in 13 minutes. I could probably shave more time off that with better suspension and skid plates, but I was happy with it. I averaged almost 30 miles an hour for the whole trail. It was a rough ride. I couldn’t keep any of the video because my camera mount fell halfway through. I also rocked my stereo’s dash kit out of place too. Oops. I pushed it back into place and kept driving. Speed runs can be dangerous; please don’t be stupid. We deliberately hit the trail late in the day to avoid other vehicles. We ran the trail on a Saturday evening in the middle of August. Even if you think you have the trail to yourself, be extra cautious around corners. There are several blind corners on West Magnolia Trail. Let me know if you run West Magnolia Trail. I’d love to hear your thoughts about it. I actually went back up to West Magnolia Trail about a week after writing the first draft of this article. It was still fun, but we took our time and finished the trail in about 20 minutes. Honestly, I prefer running this trail at speed. Taking it slow was boring. Mother nature made this trail for speed. You don’t have to navigate difficult rocky sections or find the “right” line; you can pretty much blast through it with reckless abandon. That’s what makes this trail fun.